During the 1950's and early 1960's, The University of Tokyo conducted extensive research for Mitsui Mining and Smelting Co., Ltd. to study the effects of adding Perlite to turf grasses. 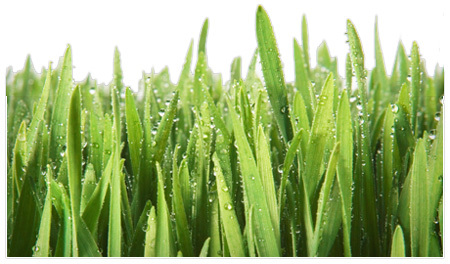 "With just sand or reddish loam soil, it took only 9 days for the rye grass to wither. In contrast, the Perlite and soil mixes took 13 days to wither (a 44% improvement), and the grasses grown in 100% Perlite took 28-32 days to wither!" (A 355% improvement)." Because of the increasing frequency of draught conditions throughout the World, there has been renewed interest in the role of fine Perlite as an amendment in landscaping and turf soils. In particular, there has been renewed interest in looking at how Perlite is being using in both Japan and Israel, and in studying whether finer grades of Perlite should be used more and more to prevent draught damage. To accomplish some of these goals, Dr. Grady Miller at the University of Florida was asked by the Perlite Institute to conduct a basic study on the use of Perlite as an amendment to sand, clay, and loam; and on how varying amounts of fine Perlite performs in these soils and how 100% Perlite performs. Curiously, what was found was that Perlite did not help germination per se. The 5% addition of Perlite to clay brought significant improvements in turf cover, dry weight, and turf color after one month of growth. For the sand and loam substrates, Perlite improved the available water. While the 100% Perlite treatment never really looked good due to poor establishment and poor growth, no other treatment was able to sustain more than 50% color past 21 days without water; whereas the 100% Perlite retained 69%! By 28 days without water, no other treatment had more than 1% green color and the 100% Perlite still had 38%. At 35 days it had 20 % and all the others were recorded at 0% (e.g. they were dead.) Only the 100% Perlite treatment was still loosing weight from water after 28 days. The Perlite Institute and its members will now begin looking at the affect of fine Perlite on landscaping plants and scrubs. The studies will try to demonstrate whether Perlite can help prevent draught damage in plants and scrubs as much as it seems to work with grasses. 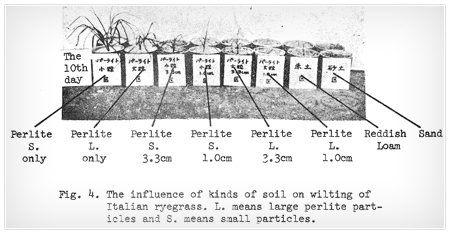 A picture of the effects of fine Perlite from the original Japanese study.